If any place in modern America might play host to a haunting, a funeral home might be a logical choice for some departed spirits to hang out. It is after all, the last stop for most of our earthly remains. And, if spirits don't want to leave the earthly realm, this might be the place they would stay. Here is the story of such a haunted funeral home provided by listener, Kim Wilson, from Kokomo, Indiana. Believe it or not. It's your choice. Notice in the photos below, the dim orbs of light in various locations. Photo experts claim that these artifacts are commonly produced as artifacts on digital camera images where flash is used in a dark location and are the result of the flash reflecting off dust motes or small fling insects. Editor: Personally, I have never seen any of these artifacts on photos I have produced on my digital camera, but the explanation may be valid for some types of cameras taking photos under certain specific lighting conditions. In 2000 I purchased some property in downtown Kokomo, Indiana. One of the lots was the only black owned funeral home in central Indiana darning the early 1900's called, Jacob's Funeral Home. We spent the next year or so remodeling the 2nd level which we now rent out as a downtown apartment. The second level was remodeled for office space used by law offices and insurance companies. The total square feet is about 14,000. In 2003 we started remodeling the 4,000 square foot basement. After a few months of knocking down walls and moving old doors and windows left down there we came into problems with piles and piles of old rotted boxes in one of the old store rooms in the basement that had been blocked off by the debris. Since then my wife has been going through the boxes and all the items inside them, cleaning up anything she can salvage. A lot of the boxes contain stacks upon stacks of old funeral home records and documents that are rotted and you can hardly read them but, several of the first boxes she has went through have items like artwork, old photos, picture frames, jewelry, melted candles, antique candle holders, old gas lighting equipment, and even an old wash basin which was used during the embalming process. Some of the boxes where marked "personal belongings" which was kind of creepy and disturbing none the less. We kept putting them aside. We finally opened a few of them up and dug through them. We believe these items inside the boxes are actual belongings that was not properly placed on the corpses and in their coffins. Some of the boxes we've gone though have things like old bibles which are in bad shape, jewelry, one has a gold wedding ring, and another a creepy little rotted stuffed animal. Kind of sad, but creepy as hell especially since a lot of them have photos inside. Anyhow, after we are finished with the basement and demolish the coal chamber we hope to start remodeling the 3rd level which is an estimated 3,000 square foot attic with many rooms. I've seen a bunch of old funeral home furniture, new looking boxes, dusty old frames, chairs, and other miscellaneous junk in it. We hope to sell most of the stuff on eBay or at local antique shops. I looked through the stuff in the attic a little with a flash light on several occasions. The first box I opened had a unopened 1940's steel Coke can inside with a bunch of old newspapers with dates ranging from 1932 - 1954. I don't know everything that's up there but, we're guessing it was stuff from when the funeral home was open. It will take us a lot of time to sort everything in the attic and the basement. The problem with remodeling the attic and why we keep delaying is not just because we are doing one level at a time. Our original plan was to remodel from the top down but, we skipped the 3rd level because the walls up there contain old gas lines which during the early and mid 1900's was used for lighting. It's going to slow us down and cost a lot to have them removed. Plus we don't want to stir any lead paint which we believe is on the walls of the 3rd level until we are prepared to handle it. Lead paint can be really nasty stuff to work with and clean up. Slowly, but surely, we will have everything sorted and we'll be adding all these antiques and odd items to our eBay auctions. You're probably wondering when am I going to get to the "haunting" part of all this. So here is the story according to my accounts and local legend. I'd have to say the strangest thing about this building is not the fact it was a funeral home since 1901 but, the local Kokomo legend that surrounds it which claims it as being extremely haunted. Personally it can sometimes be a real mess with all the people that drive by and park out front during the Halloween holiday but, it's not too bad. Though I must admit I've had to call the police on some kids that actually tried climbing the roof! According to local legend the funeral home has a history of racial tension and abuse. Being the only black funeral home in Kokomo and the only one owned by a black funeral director didn't help things during those times I assume. The court house is just down the block and they used to hang criminals or "the accused" in the court house lawn and take them straight to this funeral home. Something I've always wondered is why are there slave doors in the back of the building if it was black owned? The history is so mixed and strange about this building. It's impossible to find anything useful in our historical documents at the recorders office and the library. But, it's very haunted and has a violent history according to Kokomo legend and folk lore. Our community newspaper called Kokomo Tribune did an article in 2002 that speaks about this haunted funeral home. The reporter that covered this article was the Indiana award winning Feature Editor - Tom Carey he can be reached at: tom.carey@kokomotribune.com . More than likely once we get rid of all the original funeral home items, the personal belongings we found, and finish remodeling the building we'll rid ourselves of the hauntings and the haunted stigma the building has here in town. Over time we have plans to remodel it enough so people probably won't see it as a funeral home anymore from the outside. I must admit I've seen black shadowy figures on several occasions since I bought this building but, I don't really believe in ghosts or spirits coming back from the dead. I feel there has to be a perfectly logical reason for them. Many people that have worked here or rented have told me about hearing sounds and seeing black shadows during all hours. One of the things that has turned me to wonder about all this even more is the children saying things about a "black fog" in different rooms during the night. It's apparent that something is causing all this. Whispers in the hall ways, lights going out and coming back on, leaving rooms with the lights off and seeing them turn on. Even water turns on and off. Finally when the people remodeling came to me and said something about a high pitch drilling noise from the basement one afternoon I told myself and my wife I'd humor everyone and speak with a local psychic. I did so the same afternoon of the drilling. The psychic was a nice little lady but, I was frustrated that all she kept saying and insisting to me was that I shouldn't remodel and stir up the spirits in the building and I'm causing nothing but problems some people in the community would choose to forget. It was a creepy thing to say I thought and it really wasn't what I wanted to hear from her. She didn't help and what she told me, I didn't feel was what I was calling her about but, either way she refused to come over and answer questions about black figures in this building for me and she kept on and on about stopping what I was doing to the building. Before the phone call ended I remember very well the last thing she said, "You sir are playing with fire". Whatever that means but, it stuck with me. So after a few days I called a local Christian preacher who prayed for me and claimed I was involved in a demonic process and should come to church Sunday morning before it's to late. He did finally come over to the building and did some water sprinkles of whatever it's called around the place but, when he left everything started freaking out. Lights would turn off and on and we started getting light headed sometimes when we walked through areas of the building. So now every since that day my wife won't stay in a room alone when we are here. We still really don't have any clear answers on the building, the items inside, or it's terrible history but, after we finish remodeling we hopefully clean and rid ourselves of the spirits of Jacob's Funeral Home. We hope by getting rid of the items we are unearthing that the spirits will go with them to people who can help them. If you'd like to be involved you can look for all the items we find here at the funeral home to be placed on eBay for auction. 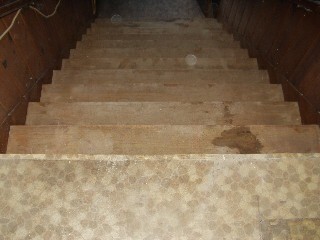 Kim is also looking to sell off many of the items contained within the building as a way to perhaps remove the spirits. If you are interesting in acquiring an object d'haunte, and perhaps get your own ghost in the process, go to http://members.ebay.com/aboutme/igmn_corporation.